Let me first start by saying that the movie Focus is not a film where a guy has to save a girl, which might be what some people might think based on the trailer. Granted, the previews are a bit confusing, but the focus of the movie is a bit more complicated than that. 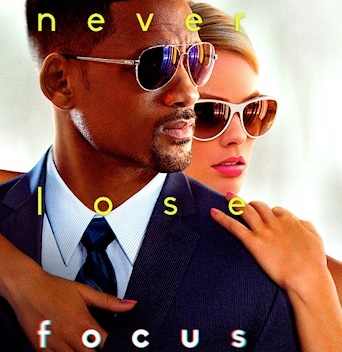 It's a heist movie about a guy named Nicky (Will Smith) -- a seasoned conman -- who introduces a girl named Jess (Margot Robbie) -- a rookie thief -- to the bigger game. During this time, the two become romantically involved. But the biggest thing to take from this movie is that it's full of twists and turns. Nicky and Jess find themselves caught up in a con that has them in over their heads -- or does it? One of the coolest aspects about Focus is that you never really know who is being conned, which speaks true to older, traditional caper movies. Although some might say that women aren't properly portrayed in this movie -- and to an extent, I would agree (if we're going to make it a point to talk about Margot Robbie's menstrual cycle and her physical appearance, then we should certainly do the same to Will Smith) -- the character of Jess plays a prominent role and isn't just another wide-eyed damsel in distress; certainly a step up from her role in The Wolf of Wall Street. She's no Angelina Jolie or Uma Thurman (the only two women I can currently think of who have successfully acted in traditional male roles -- a la Kill Bill, Mr. & Mrs. Smith, Salt, etc.) but it's a start. As a black woman, I like seeing female actors in strong roles and black actors in roles that aren't inherently related to race. The plot is deeper than it might appear on the surface so be sure to pay attention. But with any heist movie, it does make you ask yourself, "but why jump through all those hoops for that one score?" In that regard, it's no Ocean's 11, but it's still quite a bit of fun.